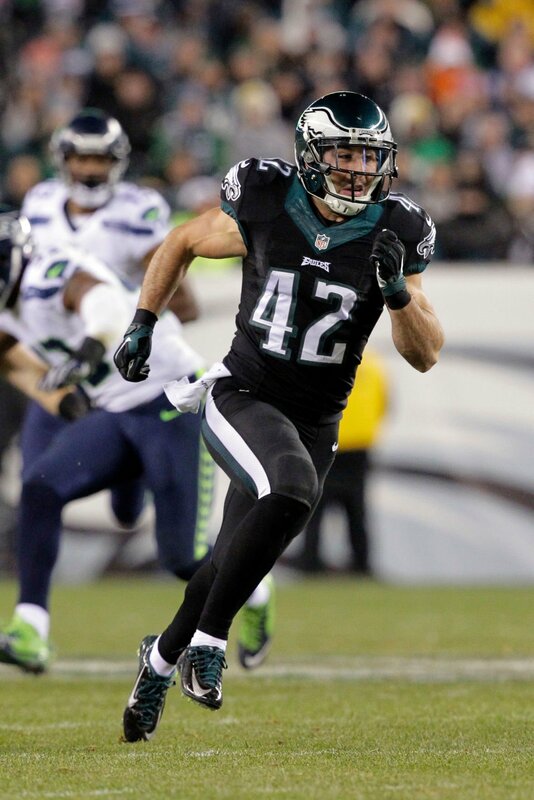 Chris Maragos runs downfield on kick coverage for the Philadelphia Eagles during a game against the Seattle Seahawks on Dec. 7, 2014 in Philadelphia. 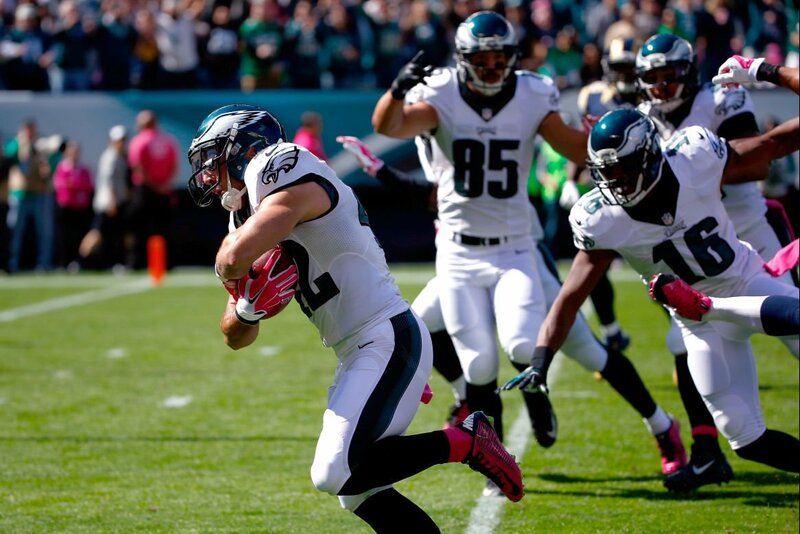 Chris Maragos, left, of the Philadelphia Eagles heads to the end zone for a touchdown after recovering a blocked punt during a game against the St. Louis Rams on Oct. 5, 2014, in Philadelphia. Bring it on, Chris Maragos proclaims. The Horlick High School graduate is 29, at the peak of his physical prowess and can’t wait to be turned loose for the Philadelphia Eagles at Lincoln Financial Field in the coming weeks. They open their preseason schedule on Aug. 11 against the Tampa Bay Buccaneers at Philadelphia. That’s downright scary, considering the esteem Eagles special teams coach Dave Fipp already has for Maragos. It’s been quite a journey for Maragos, who played his first three high school seasons at Park before transferring to Horlick for his senior year in 2004. And each step of the way has brought him something substantial. He was a walk-on receiver for Western Michigan, where he became friends with future Green Bay Packers standout Greg Jennings and met his future wife, Serah. When he transferred to Wisconsin in 2007, then-UW coach Bret Bielema switched him to safety, where he found his true identity and went on to earn honorable mention All-Big Ten Conference honors. When Maragos signed with the San Francisco 49ers as an undrafted free agent in 2010, the assistant special teams coach was Fipp. And Fipp still remembers Maragos, a fringe player who would be released twice by the 49ers, having such a presence almost from the beginning as he struggled to make the team. “He came into the defensive backs room — and I wasn’t in that room all the time — but I heard those players talk about him,” Fipp said. “He was brand new, but he had all the answers for the defense. That was the case after Maragos signed with the Seattle Seahawks in 2011 and went on to win a Super Bowl ring with the Seahawks in February 2014. And that was the case when he signed with a three-year contract worth $4 million with the Eagles in March 2014. Fipps’ role in bringing Maragos to Philadelphia? Actually, very little. Maragos’ performance did most of the talking. After the Eagles slipped to 7-9 last season, the Eagles fired coach Chip Kelly and hired Doug Pederson, one of Brett Favre’s former backup quarterbacks with the Packers. While Pederson has no head coaching experience, that doesn’t matter to Maragos. The Eagles also re-signed defensive tackle Fletcher Cox for $63 million in guaranteed money and used to the second pick in this year’s NFL draft to select quarterback Carson Wentz. And Maragos hopes to be a part of it for the long haul, even though his contract expires after this season. How does he plan to deal with that? With the same work ethic that has put him in the position he’s in. “The biggest thing for me is to go out there and play football,” said Maragos, who is the father of sons Micah, 4, and Mason, 2. “I’m always interested in talking (about a contract) and continuing my career as a Philadelphia Eagle, but at the same time, I understand this is a business. Take it from someone who has made a habit of moving forward so successfully. Philadelphia, where a man wearing a Santa Claus costume at an Eagles game was once pelted with snowballs during the Christmas season, is known as having one of the harshest fan bases in professional sports. Just don't tell that to Chris Maragos, because he learned to believe otherwise through his first two seasons in the city. "It is absolutely so fun to play for a fan base and organization that is so passionate about football," he said. "When you walk around town, they know every player on the team and they know football inside and out. "Half of them can talk about coverages and guys' responsibilities out there. I mean, the people eat, breathe and sleep football. It's one of those things where they're just always engaged. As a player, you know they want it just as bad as you do." Seems like a great guy! Best wishes to him and his family. Jackel must be a family friend as he writes many articles about this young man. He deserves to be recognized, but I wish Jackel would have a more well rounded series of articles. I think Caron Butler is the most accomplished Racine athlete. Maragos just may be #2. Sonja Henning would be 3. That might be my top 3...without putting a ton of thought into that statement. Wait....Romo if you count racine county together. Not a bad list.